Fergie threw herself an early birthday party in celebration of turning 40 over the weekend and invited her close friends and family. 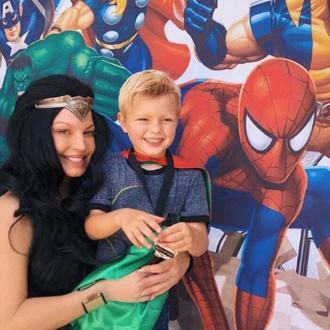 Fergie threw herself an early birthday party over the weekend. The 39-year-old star stole the show in a white silk one-shoulder gown, while her guests - including her Black Eyed Peas bandmate apl.de.ap, Kelly Osbourne and father John Patrick Ferguson, all arrived in stunning costumes to fit in with the glamorous theme. The party was held in the blonde beauty's back garden by her pool, which was decorated with white and red lights, and her friends and family boogied the night away to music, such as tracks from Maroon 5 and Sublime, played by DJ Richie Rich. Fergie's husband Josh Duhamel, whom she has been married to for six years and has 18-month-old son Axl with, marked the milestone with a heartfelt toast. Guests seemed to enjoy the festivities and left with a full stomach after guzzling down Ferguson Crest wine - a beverage owned by Fergie and her father - and scoffing a yummy berry cream cake.